Returning after its debut model year, the 2019 Toyota C-HR is poised to continue to make its way to the top of the brand’s selling list. Offering the versatility drivers are looking for from an SUV, with the style and performance you’d expect from a car. The appeal of the crossover isn’t lost on us here at Bob Tyler Toyota, which is why we’re happy to be welcoming it to our lot here in Pensacola, FL. Behind the wheel of this sporty ride, drivers can harness the power of its 2.0-liter 4-cylinder engine that is able to produce up to 144 horsepower and 139 lb-ft of torque for an exciting driving experience. What’s more, the C-HR is practical for everyday driving with its spacious design and 27 city / 31 highway MPG fuel economy. 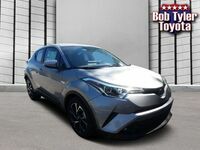 Take a look below to learn more about the new 2019 Toyota C-HR and to contact us here at Bob Tyler Toyota about setting up a test drive. After a successful debut year, the Toyota C-HR has returned with the same eye-catching design that we know and love. It features a unique diamond-like exterior styling with precision-cut lines for a look that is both stylish and aerodynamic. Standout elements include its hatch rear, unique second door handles, and boomerang taillight style.